QSL CardBoxes are back in stock and we will be shipping next week! Are your QSL's in drawers or shoeboxes? Are you looking for the perfect storage solution for those cards you worked so hard to get? We have the answer! The QSL Cardbox from HamStuff by W7NN. Whether you are a novice or a seasoned veteran of the airwaves, these boxes make all the difference in keeping your prized QSL's organized and safe. 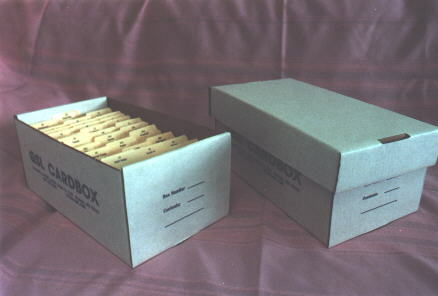 Each box holds holds about 1,000 cards of all sizes. The outside ends of each box have lines to label the contents. The boxes come with removable lids for easy stacking. The box dimensions are 5" High x 6 1/2" Wide x 12" Long.. They are made from heavy duty white corrugated cardboard with reinforced ends on both bottom and cover. They are a perfect match for the Index Dividers from HamStuff by W7NN. They also work well for photograph storage, CD storage and your blank outgoing QSL's. The price of the QSL Cardboxes is $39.00 per "6-Pak". Shipping and handling is $15.00 per "6 Pak".